In addition to being named, each “type” of tooth also has a very specific job! Incisors are used for biting into food Incisors are primary teeth D, E, F, G, N, O, P, Q and permanent teeth numbers 7, 8, 9, 10, 23, 24, 25 and 26. Canines are used for ripping and tearing food apart Canine teeth are primary teeth C, H, M, R and permanent teeth numbers 6, 11, 22, and 27. Premolars are used for chewing and grinding food. Premolars are permanent teeth numbers 4, 5, 12, 13, 20, 21, 28 and 29 – there are no primary premolars! 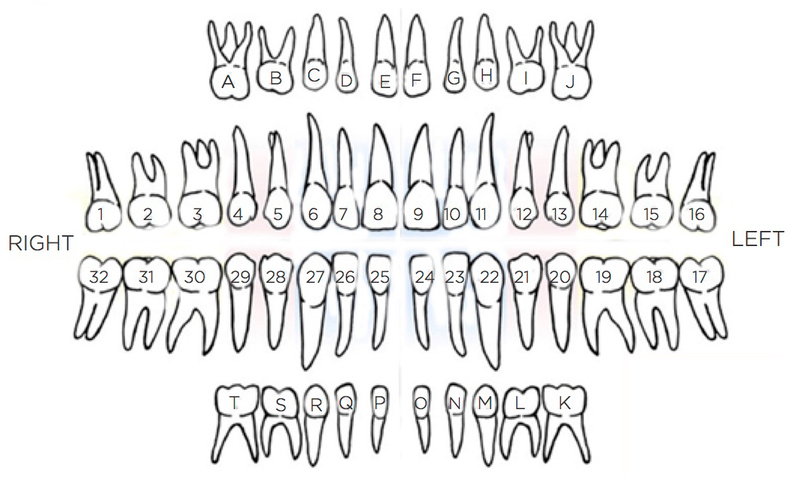 Molars are also used for chewing and grinding food Molars are primary teeth A, B, I, L, S, T and permanent teeth numbers 1, 2, 3, 14, 15, 16, 17, 18, 19, 30, 31, and 32.